Apparently 2 weeks has gone by since I last posted. I'm not quite sure where the time is flying, but it's flying fast. We've been enjoying school and failing at many art projects. Yikes. It's kind of discouraging and makes me want to quit doing art projects all together. Scooter would be fine with that, but Chewy would miss it. Plus, it's a learning opportunity. Not everything is always going to work out and sometimes you need to try something else. Week 5 found us in Mexico! The kids got their fake passports stamped and we "entered" Mexico. The talking globe has been a hit with each new country that we enter. 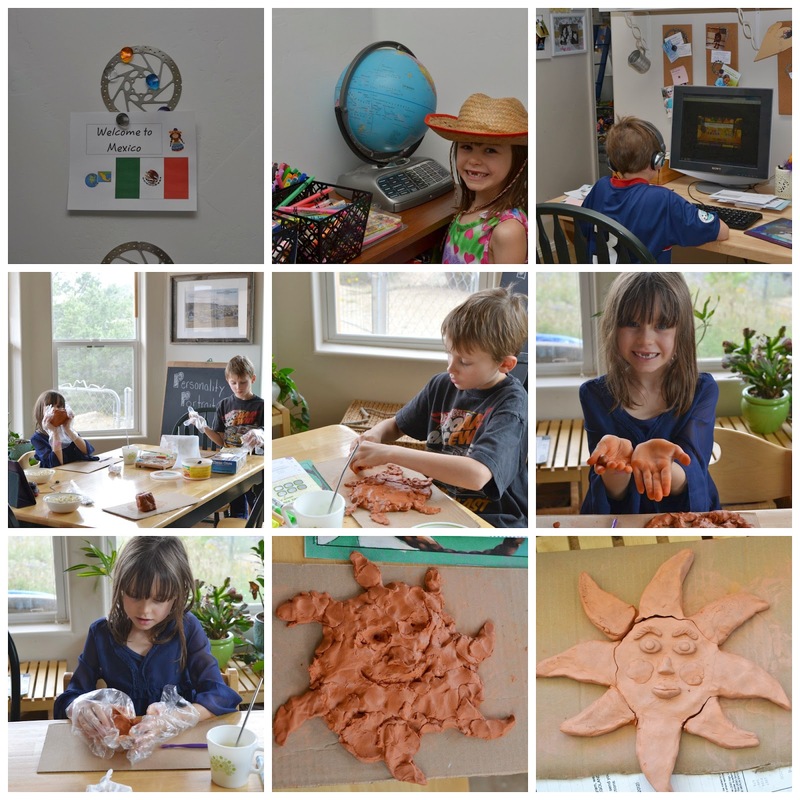 The art project that we selected for this week was Clay Sun Faces. We were getting all excited about painting them and displaying them outside somewhere. Yep, that was a failed art project. It started out great and we all made sun faces. We live in a dry environment, so things dry fairly fast. Maybe these sun faces dried too fast. They cracked. And I didn't have anymore Crayola Air Dry Clay to try again. Bummer. We made up for the failed art project with a leftover project from the USA. Our nanoblock set representing the USA arrived and we put it together. We did it in about 15 layer increments. We'd do 15 layers (I'd name out pieces and the kids would put them together ) and then we would do something else before coming back and doing 15 more layers of the nanoblocks. 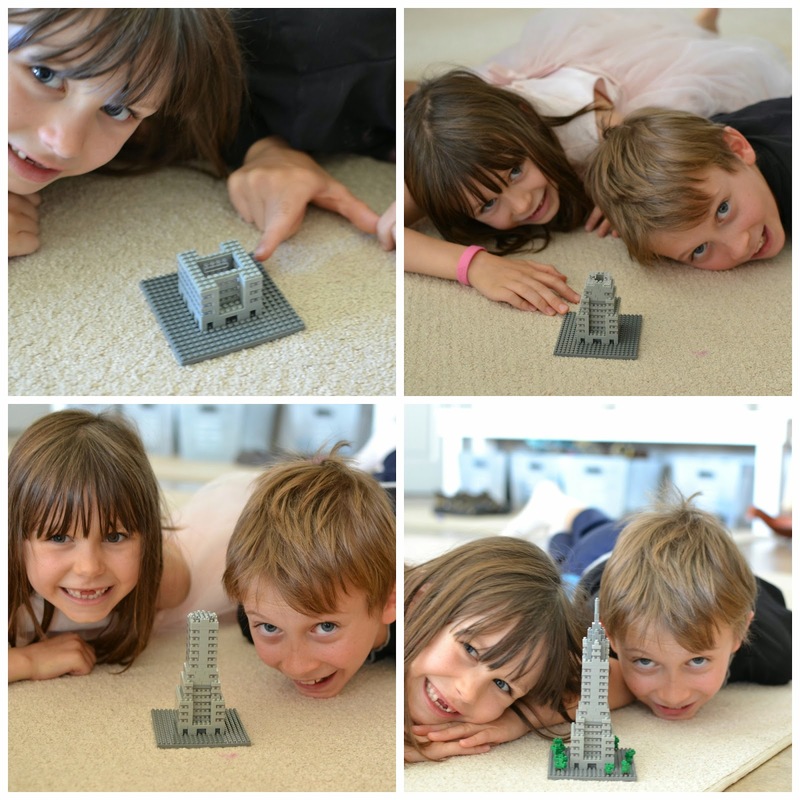 The nanoblocks were the highlight of our week. We enjoyed some science experiments. We also added in watching 2 episodes of Magic School Bus with mommy written worksheets (All Dried Up and Cold Feet). We also watched Planet Earth Deserts to go along with what the kids are learning about in science. We also happened to get an Eyewitness Video at the library on Deserts. It sounds like we watch a lot, but that's pretty much it since we don't have cable or local channels. 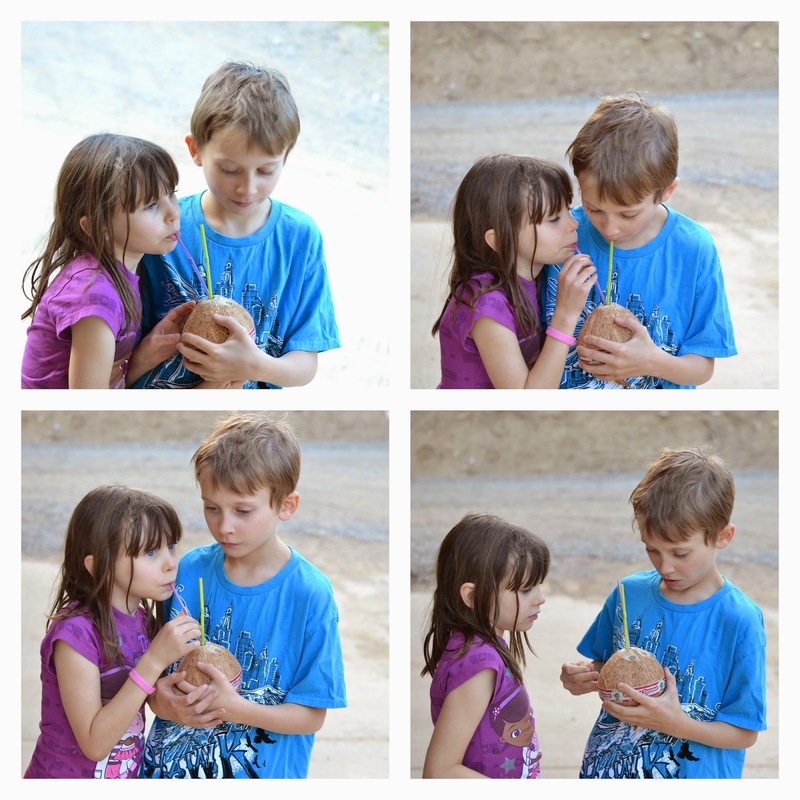 The kids have always wanted to try coconut water from a coconut, so I indulged them and let them try. That was a fun treat! 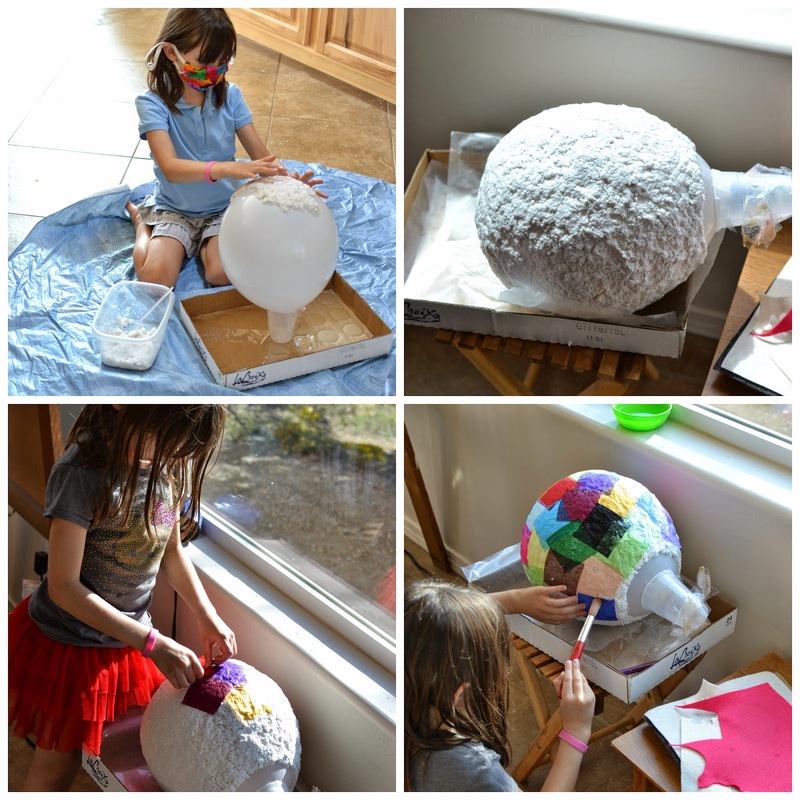 Week 6 had us doing a pinata for an art project, but I decided to have the kids start it at the end of Week 5, just in case. Good thing. It was another failed project. We tried making a paper maiche pinata with some premade paper maiche stuff that you just had to add water too. It was like playing with spit balls (and then I had to explain to the kids what spit balls were). It took forever to try, I ended up popping the balloon after 3 days and the rest of the pinata kinda sank and broke. Fail. Epic fail. I was so bummed. Week 6. Another attempt at a pinata. This time each kid made one. We stuck with the tried and true method of glue mixed with water. We dipped pieces of computer paper in it. I didn't have any newspaper. They only dried about a day and the kids used the glue/water solution to paint on some pieces of tissue paper. We ended up making hot air balloon "pinatas." There was no candy in the pinatas, but the kids put some hard candies into the hot air balloon baskets! Wondering which episodes of the Magic School Bus we watched this week? Kicks up a Storm and The Busasaurus. 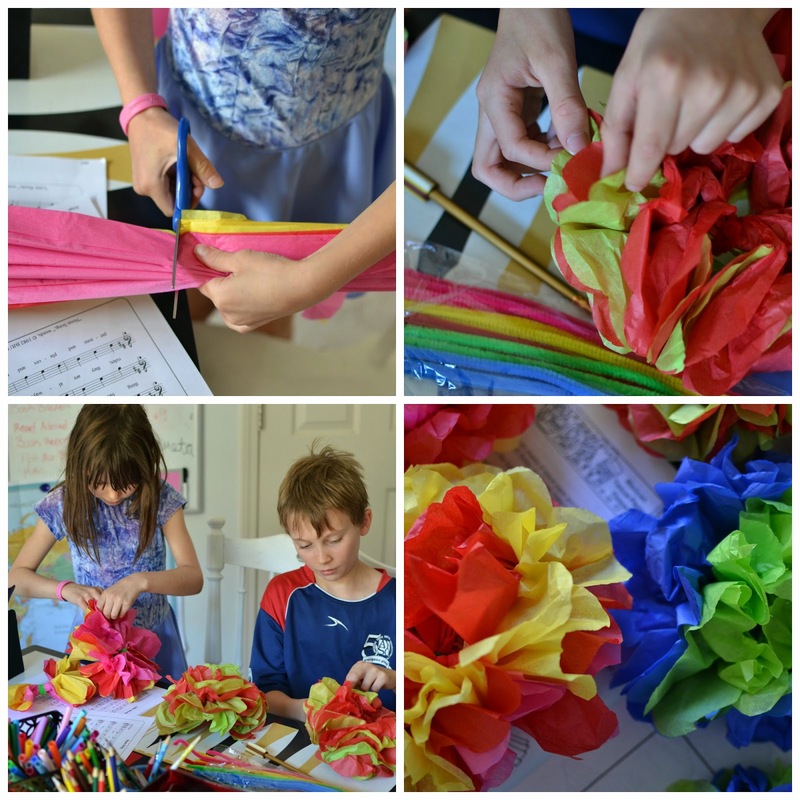 Another art project had us making some tissue paper flowers. The kids wanted to make lots, but I thought 6 was enough. We used them to decorate for our Mexican feast. At the end of Week 6 we enjoyed a Mexican feast. 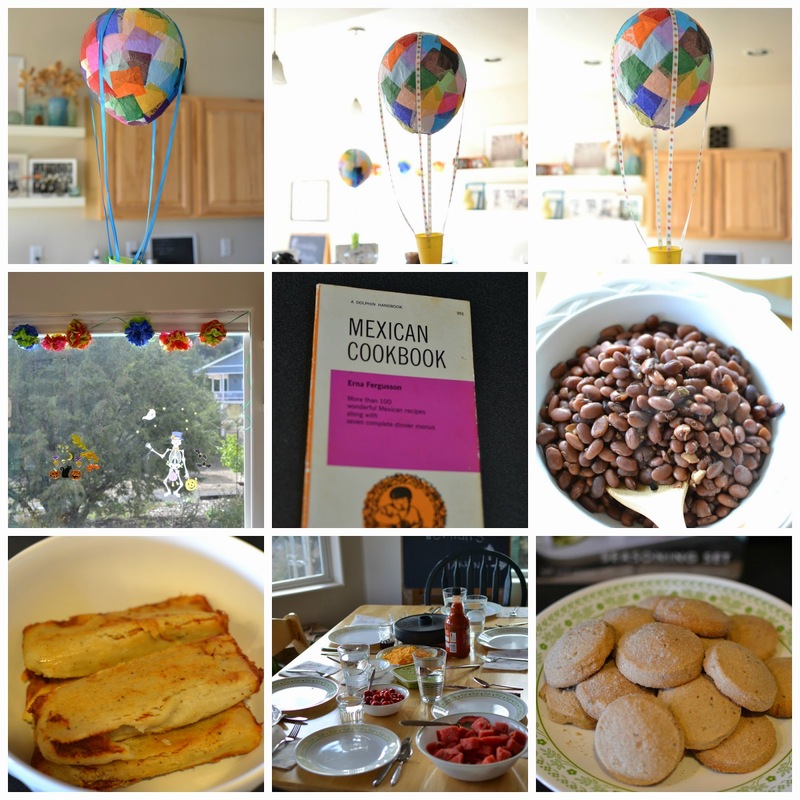 I found an old Mexican cookbook that was handed down to us and the kids picked some recipes out of it. We had tamales (store bought), tortillas, beans, guacomole, watermelon, and bischochitos (again, store bought) with tea for dessert. It was a yummy meal! For audio enjoyment we listened to Igraine the Brave by Cornelia Funke. I had actually read that one this summer and knew both kids would like listening to it. Chewy enjoyed the girl as the main character and Scooter enjoyed all the parts about the castle. They both enjoyed the talking cat! Alrighty, I think I quickly made my way through those 2 weeks. In other events, we made a trip to the science museum. Scooter's been playing away at his guitar and Chewy has been enjoying skating (especially since she now has some skate dresses and a skating skirt). The library is always fun every week and we've been meeting lots of friends there. We had playgroup at our house, while doing portraits at the same time! We've been getting the kids to the pool once a week when we can (I refuse to take them in the summer). It's not busy at the pool in the fall and winter and the kids are finally progressing! Scooter will even swim some laps with me! It's past my bedtime now. I've got 4 sessions of portraits to work on, so I may lack in posting here again. That is, unless I need a break from editing. 4 families in 4 days, that's a record for me! Not one I'm likely to repeat, but it works for now. The fall colors have been beautiful! We've been able to enjoy them on the mountain for the past 2 weeks with some hiking. Enough random writing for now, this girl has got to get to bed. What have you been up to?